The Hawke Sapphire ED 20-60x82 Spotting Scope features the finest optical quality with high resolution low chromatic aberration viewing, ED glass in conjunction with Dielectric prism coatings and Fully Multi-Coated optics producing stunning image quality. When you require the finest image reproduction at extended distances, ED (Extra Low Dispersion) glass is a must. Designed around an optical system using ED glass components, the Hawke Sapphire ED Spotting Scope produces superb images with minimal Field of View Curvature. 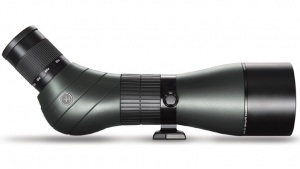 Whether your interest is in sports, bird watching, wildlife, hunting or casual astronomy these spotting scopes are sure to provide the performance you demand for years to come. This short bodied scope is extremely portable and is supplied with a sculpted stay-on protective cover.